... all for you - At least the company is congruent in living what it says. How is it all for peasants? 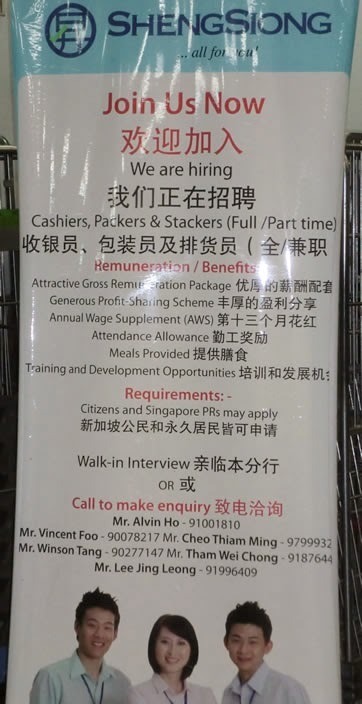 Its meteoric rise in the supermarket business in SG can mainly be attributed to cheaper groceries for the peasants compared to the fake worker union supermarket spam chain owned by the govt. Is like competing with your hands tied against a big bully. That's what makes it admirable. Look at the names of hiring people & their mobile phone numbes. Compare to the 'unknowns' listed in the ad of the pet business spam chain (earlier blogpost). Even advertising for workers is a way to differentiate itself. And it ends up as cheap advertising when i blog it as example compared to the pet business spam chain. This blogpost is closely related to my earlier How A Local Spam Chain Business Hire Cog Labor. Absenteeism & low productivity are often faced by employers of cheap labor. Most employers treat the labor as cogs - use a while like tissue paper & then throw away. Few employers treat the labor as humans. Boss of this supermarket spam chain is considered uneducated. He speaks mandarin & can't converse in english. To many educated sinkies, this type of speak mandarin, can't speak english are looked down upon. Yet this boss understands this simple incentive concept which many educated sinkies don't. For a system to be sustainable, it has to be inclusive. Look at how inclusiveness is sorely lacking in SG with regards to how the govt treats the population with the ministers paying themselves $M minimum wage while suppressing the masses' salaries. When the hybrid regime advertise 'inclusiveness' as a keywork in its election manifesto, it is clearly a sign it is gone to a large extent. Does this supermarket chain write 'inclusiveness' in its advertisement? It doesn't need to because it is reflected in their actions. For low paid workers, these 2 incentives are highly valued. For the company it helps against low productivity & absenteeism. For those of us who has been through national service(slavery), how productive are we? We were forced to show up for fear of being charged & ending up in detention barracks. Back in my NS days, every wednesday is western food for lunch. It is a morale booster. Although meals must be provided during NS given the pathetic allowance, it illustrates that food expenses are a huge percentage when the salary is low. I generally don't like businesses that spam a lot of outlets but this local spam chain supermarket business is 1 of the exception. I find that the workers are more human since the company treat them better compared to the govt's fake worker union supermarket chain. When workers are treated better, they treat customers better. Simple common sense but rarely practised in SG. Work process & standard operating procedures are easily copied by competitors. Humans are much harder to copy. This human factor is a competitive advantage. Take care of workers & they will take care of the company. Treat citizens like 3rd class & i will not safeguard SG under this govt with my life. Again is common sense not practised.